When it comes to the Christmas season most people are enjoying tons of treats and foods. 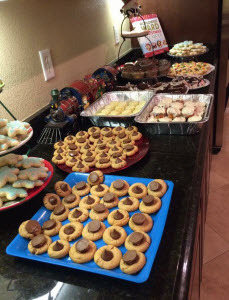 You are most likely making goodies to send to school and friends and family are getting together or dropping by something yummy. With all the extra foods that you are sure to come across this Christmas, you need to be ready to care for your child’s teeth. When you eat or drink just about anything your teeth and gums are being damaged for an hour after the food. Now you need to consider how often you and your family may be enjoying snacks and drinks during the Christmas season. Is your counter full of yummy treats that your kids are snacking on throughout the day? This is why caring for your dental health is even more important during this time of the year. Candy Popcorn is Bad for Teeth: One of the most common treats that you will find this Christmas season is caramel and candy popcorn. The problem is that popcorn in general is not great for kids to eat because the small shells can get stuck in their teeth and gums and can be hard to get out. The problem during the holidays is that the popcorn is often times covered in caramel which is basically melted sugar! Once you eat this yummy treat the sugar will be working to damage your teeth for at minimum an hour after you eat it and could be longer if you let it sit in between the teeth. Effects of Soda & Soft Drinks on Teeth: While you are out and about shopping or at a holiday party the quick and easy option can be a soda or sugary drink. These are a terrible option for kids and the health of not only their teeth but their gums as well. It is always better to go for a drink of water or at least rinse out the mouth after a sugary drink when you can. Hard & Chewy Candies Bad for Teeth: Another staple among holiday treats are candy canes. The candy cane is an option that people have that come in all kinds of flavors but they are still very sugary. The sugar can stick to your teeth which can lead to decay and bacteria. Candy canes are a great way to decorate a tree but be sure to go easy on how many you choose to let your child eat. Is Cheese Good for Your Teeth: There are many foods and drinks that are not good for your teeth but one that is okay to get is cheese. A cheese platter is a great option for your teeth because it can help to balance out the acid that is found in many other treats and drinks. If you see cheese next to cookies and sugary treats, go for the cheese. Take Care of Teeth at Home: During this time of the year, make sure that you are diligent in caring for your teeth. You want to brush often, rinse your mouth out and floss regularly to keep the excess food particles off your teeth and gums. Smile Reef offers dental cleaning, exams and more at our office so call today to make your appointment. Especially to those first time parents, getting your toddler to brush their teeth can be a battle. You may be lost on how to approach teaching this every day ritual. Keeping your kids teeth brushed is important. They will carry these teeth for quite a while. Kids will start to lose their baby teeth around the age of 6 or 7 and can take until ages 10 or 12 to lose them all. Make sure to teach your kids that brushing is important and needs to be done every day. Now a two year old won’t understand the importance, but you can start creating habits. 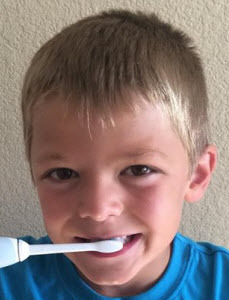 Smile Reef will cover some tips and even mistakes parents have made in the past, to aid you in teaching your little one how to brush their teeth. Keep in mind, moms and dads; you will need to continue to assist your children in brushing their teeth until they are about 7 years old. If proper brushing is not taught, it will lead to cavities and tooth decay. 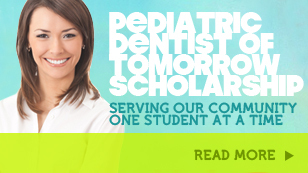 By age 7 they are able to do a thorough and proper cleaning of their teeth if monitored. First tip is to brush your teeth in front of your kids. They learn by observing us. If they see you brush your teeth after each meal, it sends a subliminal message. When it comes time for them to start brushing their teeth, it’s already a familiar example of what mom and dad does. This will make your beginning approach a little easier and less scary to your little one. This is another common mistake. Parents will often sit the child on the toilet to brush their teeth. This is not good. Stand them in front of the mirror. How else will they see what you are doing and learn? It may be more difficult for you as a parent to brush your kid’s teeth while they face the mirror. But you will find they learn to do it themselves faster. Don’t skip teeth brushing. If you have a scheduled routine, stay on it. If not, it teaches your kids it’s ok to miss a brushing and eventually they could skip it all together. Keep it positive. Don’t use it as a punishment or don’t get upset if your child gives you a hard time. Make it positive and if possible, make it fun. Make it a family event, even if you have your little one practice on your teeth. If mommy or daddy brushes their teeth it’s exciting for them to do the same. However keep a pleasant look on your face especially when it comes to a 2 and 3 year old. Don’t make brushing teeth a bad thing. Here are but a few ways you can encourage your little one and let them know that brushing teeth is a positive thing to do. You can do the same for flossing as well. Keeping your kids teeth healthy now will help them have good teeth and good habits in the future. Smile Reef wishes you luck and patience in teaching your kids the importance of brushing their teeth.